Berlin Wall, Vaterland graffiti artwork. This artwork by Gunther Schaefer was painted in March 1990. 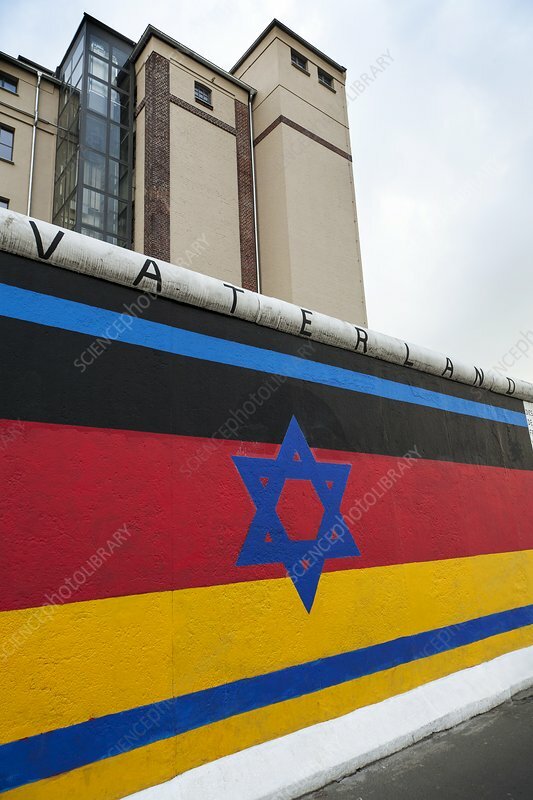 Combining elements of the Israeli and German flags (including the Star of David), it symbolizes Fascism and the Holocaust. This artwork is one of several that were painted on the Berlin Wall's non-graffiti-covered eastern side in the months after the Wall fell. The 155-kilometre-long Berlin Wall existed between 1961 and 1990, dividing West Berlin from East Berlin and the rest of East Germany. The concrete sections were 3.6 metres tall. Photographed in April 2014, in Berlin, Germany, on a 1.3-kilometre-long stretch of the Wall known as the East Side Gallery.